Less than a month remains for the most awaited food event of the year! 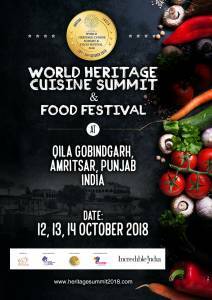 A few weeks from now some of the top chefs from around the world will congregate in Punjab’s culinary capital, Amritsar, to share, interact and talk about food and to do what they do best…create food magic! The event will feature tasting of traditional recipes by chefs from 15 countries, Master Classes for upcoming chefs and plating and display of traditional food by chefs from 40 countries and 20 from India. India is a veritable treasure trove of recipes with its various regional specialties. There will be plenty to taste from across India, with a special focus on Amritsar street food…all of this under one roof!And if you are looking for a once in a lifetime opportunity to witness something memorable, do join in the early morning chefs procession to Golden Temple.